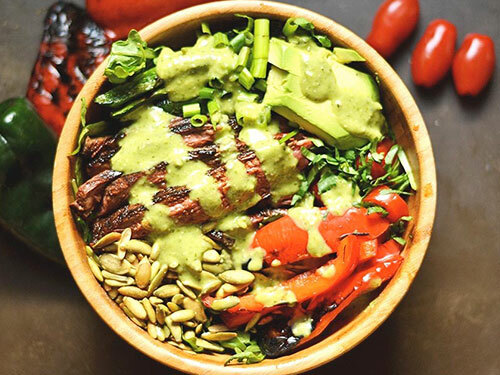 Avocado is a paleo staple for its healthy fats, creamy flavor, and a superpower that allows it to replace lots of different kinds of non-paleo ingredients. Try these paleo avocado recipes for sweets, dinners, and salads using your favorite green fruit. Sometimes the simplest recipes make a great impact. That’s definitely the case for these adorable avocado cups filled with orange juice-soaked spiralized carrot, chopped bacon, and lime. They’d be perfect for a party! I recommend serving immediately when they’re ready, because the avocado may begin to get funky. Avocado can help make green smoothies more filling and add healthy fats without messing with their pretty green color. 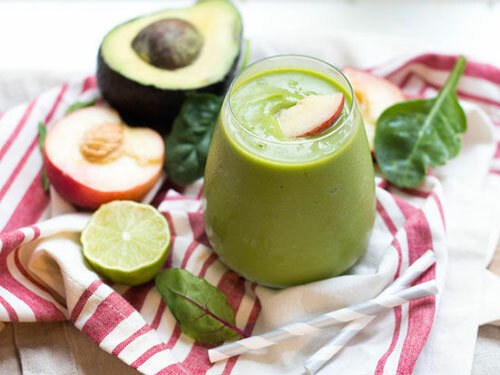 This one is made with frozen peaches, spinach, fresh lime juice, and coconut water. It’s creamy and sweet, but really healthy, too! Made with riced cauliflower and almond flour, these veggie burgers are so good that you won’t miss the meat. They’re seasoned with chipotle peppers and served with an amazing tomatillo avocado salsa complete with lime, onion, and jalapeno for maximum flavor goodness. These jalapeno waffles are enveloping a sandwich of bacon, grilled pineapple slices, red onions, spinach, avocado, and fresh cilantro. Does it get any better than a savory waffle slider? No. You won’t taste the avocado in this smoothie bowl filled with frozen blueberries, ground flexseed, acai powder, hemp hearts, and coconut water, but you’ll know you’re getting lots of healthy fats to support your body systems and keep you full longer. I’ll likely share a few of these avocado pudding recipes, because they’re so good and there really are a number of ways to make them. This one has avocado, banana, raw honey to sweeten, raw cacao powder (or unsweetened cocoa) and a big pinch of sea salt. Easy! Believe it or not, this delicious salad is suitable for a Whole30 diet! You get to use flavorful ignredients like bacon fat, cherry tomatoes, cucumbers, smoked paprika, and a homemade buffalo ranch dressing—there are two versions so you can choose to use coconut milk or homemade mayo. This tart is going to blow your mind. The crust is made with medjool dates, pecans, and shredded coconut along with lime zest and sea salt for flavor. Fill it with the creamiest, smoothest tart filling made with lots of fresh lime juice and sweetened with agave (or coconut nectar or honey). These wraps will make your take-to-work lunch easier than ever before. Use Wrawp wraps or another paleo-friendly wrap of your choice, and it’ll be so tasty with tuna, avocado, homemade pesto, cherry tomatoes, and a handful of healthy spinach for good measure. Avocados make a great medium for stuffing because they add so much on their own, too! They are more than just a vessel waiting to be filled…filled with a delicious mixture of garlic, shrimp, paprika, mango, and scallions. Drizzle it with homemade jalapeno aioli. Avocado is great as a part of your breakfast, and it goes especially well with Mexican flavors and ingredients like onion and Turkey chorizo. For this recipe, you’ll want to leave out the black beans or replace them with more turkey Chorizo. Garnish with hot sauce and fresh cilantro! I love berries in salads! They help keep everything light and summery in this salad with crispy chicken and creamy, refreshing avocado. All of the flavors, textures, and ingredients in this salad really do balance each other out so you’re getting a little bit of everything. This zesty chicken is made with lime juice and olive oil along with fresh cilantro, ground cumin, and sea salt. It’s bursting with flavor! Top it off with a fabulous avocado salsa made fancy-style with red wine vinegar, red pepper fakes, lime juice, cilantro, and garlic. This salad is kept simple and sweet and gorgeous strawberries, creamy roasted sweet potato, basil, orange, avocado, and greens. The simple Dijon-balsamic dressing has a touch of coconut sugar to play along with the sweet theme. This recipe has a handful of different steps, but for those juicy burgers, delicious jerk onions, and avocado salad, it’s worth it. 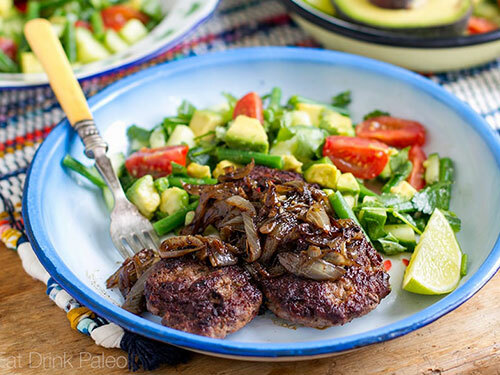 The onions are full of cinnamon, allspice, garlic, and coconut amino flavors while the avocado stays cool and refreshing and the burgers are perfect and savory. I can’t get over the flavors and colors of this creamy soft-serve ice cream with only four ingredients. The avocado makes it creamy while the raspberries take over the flavor along with a bit of lemon juice and vanilla bean powder. If needed, you can add a touch of honey. Who needs a taco shell when you have a sweet potato? These avocado-topped tacos are made with lean ground beef, garlic, onions, cumin, paprika, and more. Serve with guacamole and a coconut-cumin cream made from lime juice and coconut cream. This juicy, chunky guac is the best thing you’ll ever put on your paleo chips, plantains, and veggies. Seriously. 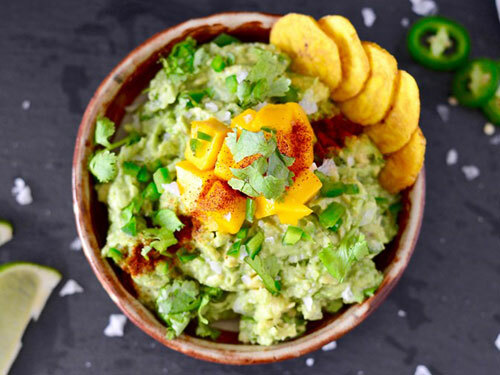 Make it with ripe avocados, mango, cilantro, lime juice, jalapenos, garlic, salt, pepper, and chipotle chili powder, which you can adjust for heat. This Thai-inspired guacamole is a fusion of some of my favorite flavors like ginger, garlic, jalapeno, avocado, rice vinegar, and quick pickled carrots. The recipe recommends omitting the soy sauce for a paleo version, but you could also substitute coconut aminos. Just like you can make chocolate pudding with avocados, you can make chocolate ice cream! 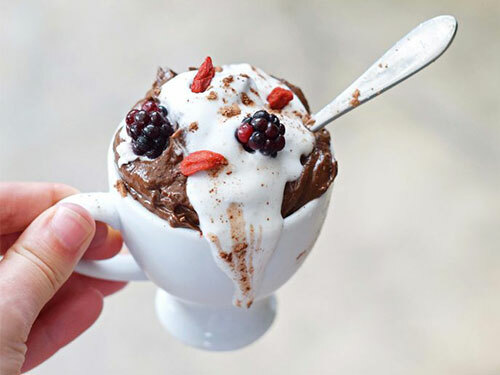 This recipe uses full fat coconut milk, avocado, raw cacao powder, coconut nectar, cinnamon, and vanilla powder or extract to create a creamy and chocolaty treat with no dairy. This recipe really couldn’t be easier. You’ll got just a handful of ingredients: butter, eggs, sirloin steak, avocado, salt, and pepper. 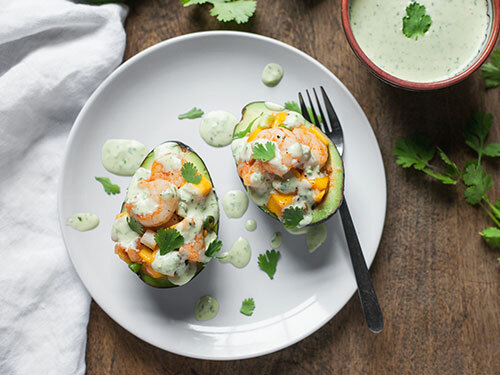 Cook them up just the way you like them and enjoy those buttery flavors and the refreshing contrast of cool and green avocado. Avocado can make a really wonderful dressing for everything from salads to meats. Give it a try on these flavorful fajita steaks with coconut aminos, lime juice, chili powder, cumin, and more. The dressing is super easy with pepitas and apple cider vinegar. Here’s a simple avocado soup that is so perfect for summer time when you need a fresh dinner but you can’t bear to turn on the oven or the stove. It’s refreshing and easy, made from avocados, cucumber, vegetable stock, coconut milk, almonds, lime, salt, and chives. With only a handful of ingredients, this may be the easiest and tastiest guac you’ll make. All you need is ripe avocados, mango, tomato, cilantro, lime, garlic powder, salt, and pepper. If you want to add some eat, throw in a jalapeno or some canned green chilies. Served with avocado slices, this breakfast is packed with a variety of colors, textures, flavors and nutrients from a crispy fried egg to earthy mushrooms. The roasted tomatoes have a deep, sweet flavor and you can douse everything with a dash of hot sauce. 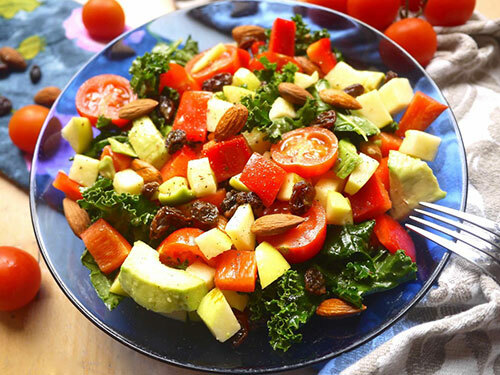 This salad is made with chopped kale, cherry tomatoes, avocado, red pepper, raisins, almonds, and apples. I love the contrast of creamy avocado with crunchy apples and sweet, chewy little raisins. Top it with a simple dressing using olive oil, lemon juice, mustard, and ACV. This chicken salad would be ideal for a summer picnic, though I’d recommend serving it as soon after making it as possible. It’s got chopped chicken, avocado, apple, celery, red onion, fresh parsley, olive oil, lime juice, and garlic powder. No shortage of flavors here! With more of a sorbet texture than an ice cream texture, this unique chocolaty treat employs delicious avocado and sea salt for a salted chocolate flavor. All you need after that is Thai coconut milk, cocoa powder, and pure maple syrup to sweeten it up. All you need for this salad is a bunch of kale, shredded purple/red cabbage, English cucumber, antipasto herb garlic cloves (YES please), and a ripe avocado. It tastes decadent but it’s really easy to throw together at lunchtime when you need food in your belly fast! 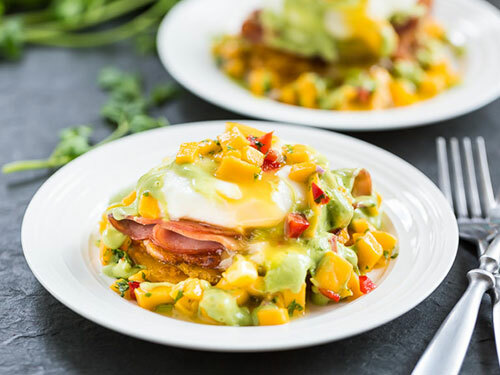 Instead of an English muffin, this eggs benedict is served up tropical-style on tostones with a mango salsa made with fresh lime juice and red onion. The avocado hollandaise is like the icing on the cake, with more fresh lime, sea salt, and baby spinach for extra color. You can make these burgers completely from scratch with a fabulous salmon flavor and an easy avocado salsa. Salmon goes so well with the flavors of avocado, poblano pepper, green onions, and fresh lemon or lime juice. Add a dash of salt and pepper and that salsa is ready to go. With you could still enjoy a nice slice of avocado toast even though you’re paleo now? You can! This recipe includes a quick two-minute toasted English muffin as a base for your avocado, fresh tomato, basil leaves, sea salt, and black pepper. Looking to squeeze more veggies into your day? Why not start with breakfast! Try this breakfast bowl filled with sweet potato, garlic, kale, eggs, broccolini, avocado, sesame oil, and chili flakes. Choose a paleo-friendly mayo to replace the Vegenaise, or use homemade. 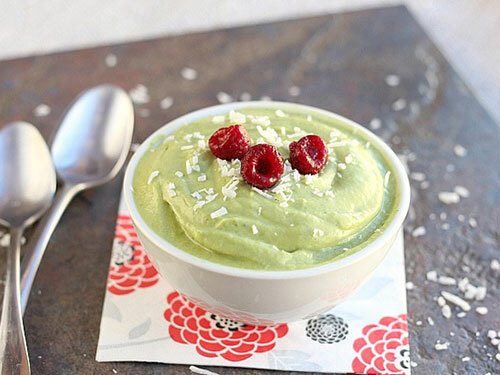 Made with mostly avocados, this avocado and lime pudding doesn’t try to hide its unique flavor behind chocolate. Let the avocado shine through! You’ll also need raw honey or maple syrup, optional frozen cucumber, sea salt, vanilla, and a hint of stevia to taste. You know that terribly disappointing feeling when you open an avocado and discover that it wasn’t ripe yet? Next time that happens, try making this easy salad with a firm avocado, thinly sliced red cabbage, red bell pepper, eggs, and seasonings. Let’s close this out with a totally over-the-top amazing recipe, shall we? If you want avocado toast but don’t want to go the route of a healthy paleo bread, try this version with sweet potato slices. Sweet potatoes are super nutritious and extra delicious in this recipe, with ripe avocado, eggs, radishes, microgreens, sundried tomatoes, and more.